Celestial Emissary (星界からの使者 Seikai kara no Shisha lit. "Emissary of the Astral world") is a Great One Boss and Chalice Dungeon Boss in Bloodborne. During this fight we see a crowd of Celestial Mob with the Celestial Emissary boss (which looks exactly like the other Celestials) hiding between them. While the other Celestial Mobs are hostile and chase the player, the Celestial Emissary stays back, giving the player a way to recognize him. An easy way to pick out the Emissary in a group is that he will have no life bar above his head when struck. Gain 0 Insight for finding the boss and 2 Insight for killing it. In the Orphanage, in Upper Cathedral Ward (requires Orphanage Key dropped from enemy). At the beginning of the fight there will simply be lots of Celestial Mobs trying to attack you. After he has lost 50% of his HP, the Celestial Emissary grows in size and acquires new attacks. Around the 25% HP mark, he will start growing tentacles in his head, similar to the Celestial Mobs that hurl arcane projectiles toward the player (note: this variant of Celestial Mob is not present in this boss fight). Celestial Mobs will keep spawning as long as the boss is alive and every Celestial Mob left will die instantly when the boss dies. In the Great Isz Chalice version the boss is more aggressive before the transformation and will hound the player. There are no extra enemies so it is easier to focus on the boss and dodge his attacks. After the transformation he may use his Cosmic Barrage attack if you back up to a medium to long range distance. Dodge his Cosmic Barrage either by sprinting in a circle or hiding behind the the convenient pillar placed in the middle of the room. All his moves except for the sudden Quad Stomp, and slightly quick Penta-Rush, are heavily telegraphed and are incredibly easy to dodge. Stay behind him when possible and shave off his health. You should pinpoint the correct alien at the beginning and focus on him. On his last phase, you need to stay close to him so that he won't cast his laser spell at you as it is very strong. A good way to avoid it is by standing behind a pillar while killing the mob. It is possible to one shot this boss. During the transformation animation, get behind it and land a charged attack followed by a visceral attack. Control the horde that is running to you by using wide range attacks (e.g. R2 of the blade of mercy, which can hit 5-6 of them in one swing). Be patient and chip him away, he does not have that much HP. A leveled-up Tonitrus can get him into his second phase with two well timed combos. Trick the weapon, clear out the mobs and then attack him mercilessly. You get ~6 seconds to attack the boss if you can clear out the mob entirely before they respawn. Shaman bone works in this boss fight, and will cause Celestial Mobs to attack the boss. Lore theories can be found under Kin Lore. At which point in the game can the celestial be found? So did I understand that right that this thing was the master project they hoped would help them making contact with the great ones? 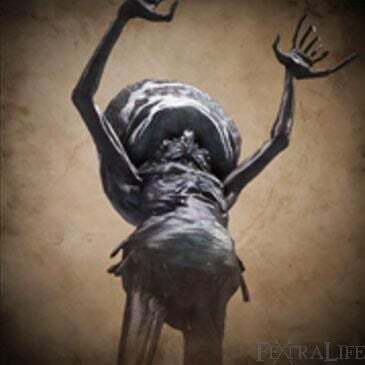 I want to believe.... that somewhere in Isz, you can find a wandering giant Celestial Emissary.... So far no evidence, but the truth is out there. I kill him at fist try (alone) and without too much difficult. I don&apos;t get it, would someone explain this? I thought I&apos;d be able to find the explanation beyond "lol memes", but that is all I&apos;ve been able to find. Threaded Cane makes this a cakewalk, no different from clearing trash. Using a charged attack with the 2H hunter axe cuts the little guys down like a lawnmower. Solid fun. I didn&apos;t realize until recently that it has the ability to buff all of its allies. I usually kill it too soon for it to happen, but I was goofing around and it suddenly raised its hands to its face as if it was praying, then raised them over its head, and a massive blue corona spread throughout the arena, granting all of the surviving mob severely boosted offense and defense. The eyes of the affected allies started to glow more brightly, almost like an enemy that has stolen your blood echoes, except the color was different. I think its health has to be at 25% for this to happen, and I&apos;m pretty sure the buff lasts as long as the affected enemies remain alive, and any replacements that spawn later will go back to being pathetically easy to kill. Maybe it isn&apos;t new knowledge, but I don&apos;t think I see it mentioned anywhere on this page? The boss actually almost killed me that time, lol. I died twice to this guy. Should I should just let Gehrman kill me at the end. 1: Go into the swarm and quickly identify the boss; he&apos;ll be the one without a health bar over his head. 2: Kite the swarm away, and rush him. Use a Shaman Bone Blade on him. 3: Dodge away, and let the swarm attack him. 4: To make it more brutal, be behind him and use any weapon with an R2 thrust. The easiest boss fight ever in the game. I took the time to piece together whatever amount of "lore" I could for this boss, mainly because most things I&apos;ve seen are just mocking how easy it is to beat this boss.It says in the Orphanage Key description (which the fight takes place in) that the Orphanage is where the Choir was thought up, and that it turned orphans into members of the Healing Church&apos;s "think tank," likely in the hopes of coming up with solutions to the scourge and blood evolution.This may not be worth saying, but I would also like to point out that it was "shadowed" by the Healing Church, which in the context could be defined as:1. "accompany (someone) in their daily activities at work in order to gain experience at or insight into a job"2. "follow and observe (someone) closely and typically secretly"Meaning that the Church presented the Orphanage by telling the yharnamites that it would simply by scholarships for orphans, though the work and experiences presented were in the interests of the Church alone, and possibly without the orphans being any the wiser.It should be noted that the area is connected to the DLC research hall, and underneath the Living Failures boss fight. The Orphanage is also in the DLC as a garden tended to by variants of the bulging headed beings with the powers of the Church Orphans (I call the smaller emissaries that because I hate that their names are often the same as the boss, and to differentiate them), and some of the other patients mentions that they were there for doing something wrong, and the Living Failures certainly look like unstable crazed versions of the Celestial Emissary (their stronger powers but lack of Great One status could be that they did not maintain a stable state, which would be required for proper ascension to take place, hence them being called Living Failures). Even the patients that attack you without magic will utilize a version of the five hit combo of Church Orphans at times.These patients are implied to be the way they were because of an eldritch parasitic bacteria in the water that they were to imbibe (which means to guzzle like alcohol or absorb through pores) that caused their brain fluid to congeal and move about like an organism, and that this was done in the belief that those who can gain a connection to the deep sea become connected to the Great Ones in some way.An interesting description for a brain fluid reads "Once, a young girl had an older brother who was determined to become a doctor, and so she wilfully became his patient. In the end, this led to their encounter with the Eldritch Truth, for which they considered themselves blessed." It is my personal belief that these children were members of the Orphanage, and had the idea of imbibing eldritch water in the first place, which appears to have allowed them to realize the Eldritch Truth and popularized the idea of gaining the "eyes on the inside" by doing this.So perhaps these patients were Orphanage members being transformed into the "potent unseen thinkers" by forcing them to gain the "eyes" necessary for transcended, and therefore advanced thought, making them capable of perceiving the voices of Great Ones. Adeline may have been an example of the final success (though since this technically occurs in the past, with which you interfere with there, it likely was not her who did this originally) in which a patient transcribes the voice of a celestial attendant (key word Celestial) and discovered the ability to become true Kin by transforming into Lumenwood.This plant is clearly connected to the Celestial Emissary and the Church Orphans, as they grow from the flowers tended to by the patients of the past (and the area is known as the Lumenflower Gardens), and the Living Failures grow from the plants in the Lumenwood Garden above the Celestial Emissary boss garden.When you equip the Milkweed rune, you become a Lumenwood Kin. And this is kind of a stretch, but it could be said that the structure of the tree is reminiscent of the Church Orphans&apos; head build, and they share the same colors as well.I also want to mention the fact that one of the brain fluids points out that mankind has potential, but it is rarely noticed and realized, until after the fact. This hints that the Church Orphans are the result of messy, forced evolution of mankind that Laurence wanted, which to be honest seems worse in comparison to Wilhelm&apos;s method that is utilized in one of the game endings.It has been predicted that mankind will eventually evolve a large headed appearance similar to aliens, and that alien encounters are simply encounters with evolved humanoid races, which is technically what you experience with this boss fight. So perhaps the Lumenwood Kin eventually move beyond their tree forms, and become the organisms that the Church Orphans are, with one of them possibly becoming a Great One and possessing ascended manipulative powers over the cosmos.Lastly I want to mention Iosefka, who is part of the Choir, creating Church Orphans out of people. If visited after defeating Rom, she will be suffering from a writhing in her head, which she attributes to the ascension into a higher being. She was likely trying to replicate the successful ascension of the Celestial Emissary by using the water and brain fluid method, meaning that it does indeed work, and she even developed a umbilical cord native only to Great Ones and their mates (though the cord may have been put there by Oedon, since before Rom dies she can drop the Oedon Writhe rune, which can either refer to the writhing brain fluid or be a mistranslation of the word wreathe as in making a wreath. Then again it is heavily implied that Oedon&apos;s child was with Arianna, as mentioned in her cord that her corrupted blood made her susceptible to this liaison, in reference to a sexual relationship that is done secretly and unfaithfully)So to summarize my idea for the lore of this boss, I have theorized that the Celestial Emissary is the first and only human being (probably an orphan) to ascend to Great One status using the methods advocated by both Laurence and his Church, and that the Church Orphans are the ones that became Kin but did not become Great Ones. As a human that became a Great One, this Celestial Emissary is named this because there is now a solid connection between man and Great One that shows that humans can ascend, and honors Laurence&apos;s will by succeeding where he did not.If any of that seems unbearably stupid, please comment your own theories, and I may change my belief. This was to both encourage a discussion of lore for this boss, and simply to give my impressions, so I would very much enjoy seeing other people&apos;s lore ideas. If you have the stats for it, the AOE makes for a great way to end the Emissary rightly. And his adds, too. Back up until they are roughly in a line, then use the mini-tron. I was auto killing the adds, and more than 500 damage on the Emissary, at base stats for the mini-tron. 1. Pinpoint the correct alien. 2.Circle him with an at least +8 Gatling Gun. Optional: Run the to draw the horde away and eliminate them as needed. Celestial Emissary? More like Celestial *****missary.